I finished The Suspicions of Mr Whicher (whicher (get it?) was highly absorbing, if a little slow-moving in the middle). And then I spent a very enjoyable time with The Diary of a (Trying to be Holy) Mum. I won’t tell you how brilliant it is, because I’ve reviewed it here (and there are TWO copies to be won…comment on the post by Wednesday to be in with a chance!). So I know there was food this month, but I didn’t really notice any of it, as I was pining too much for my first love. February’s optimism turned into March’s struggle. I tried everything to replace it: crisps, liquorice allsorts, fresh scones with clotted cream – but there’s no denying that I felt entirely lost without chocolate. A friend and I went to see the Post-Modern Jukebox, and they were all kinds of awesome. In fact, I already think they’ll be my top gig of 2018 – they would take a lot to beat. Fabulous musicians, singers…not to mention the incredible tap-dancer, who made me regret quitting tap lessons all those years ago! Who knew tap could be so cool. I really hope they come to the UK again soon, as I know my older two kids would love the show. The arrangements are fabulous: contemporary pop songs, re-styled in vintage 20th-century genres. One of my favourites is their Motown version of Kelly Clarkson’s ‘Since U Been Gone‘ – have a watch/listen! 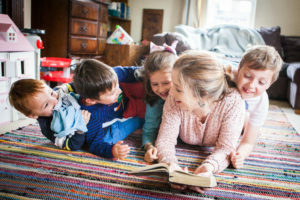 One of the very best and easiest family decisions you can ever make, by Sarah Mackenzie for Ann Voskamp’s blog, was beautiful and inspiring – and I recommend it to all those with children in their lives. I laughed out loud and nodded in agreement with this brilliantly dry piece from a Dad, on all the things he can’t do because he only has daughters. She would be better off dead is a poignant and inspiring read, on why Christians need to move towards disability. Last but not least, I found this blog post incredibly powerful: God is taking everything away from me, on Vicki Cottingham’s response to being diagnosed with M.E. The post is a few years old, but I recently ‘met’ Vicki online through Christian writers’ forums, and so have been made aware of her fantastic blog. I asked whether we should avoid Mothers’ Day just because it’s hard, and (when my husband went away for a few days) wondered if I could make it as a single parent. When my son asked a tricky question, I gave him this answer on the definition of ‘brother’. I shared some prophetic words which I received recently, asking whether we can really trust them, and I reviewed Fiona Lloyd’s brilliant book – offering a giveaway which you can still enter! It was a joy and a privilege to be able to write up the story of how four inspiring York families have opened their homes to Unaccompanied Asylum-Seeking Children – you can read it on the Home for Good website. If you’re interested, do read the stories of the individuals mentioned in the above article (I wrote these too! ): Jen, Clare, Sandra and Lynn are incredibly inspiring. * When I blogged about single-parentdom, what I didn’t say was that the hubs was away three times this month – very unusual, as he’s not often called out of town. I was surviving the middle of these trips when I blogged. No wonder I’ve reached the end of March exhausted! * We’ve enjoyed the first week of our school holidays (which are different to just about everyone else’s holidays). After two years, I can finally take all four kiddoes out on a day trip without the need for a Supporting Grown-Up, and it feels amazing! They can all walk! They can help each other out in the soft play! When they’re near a road and I call ‘STOP!! !’ they sometimes listen! Yay! * As part of the above, we may have *slightly* overdone it, with six egg hunts completed at various venues this week. And there will be more to come. I’m a sucker for an egg hunt. * And last but not least…I’ve set up a real proper newsletter thingy! In addition to the blog emails (where you receive an email whenever I post), this is more of a summary email every few weeks, where I’ll link to blog posts and other articles I’ve written which might be of interest, as well as give you an update on how my writing is going generally. And you’ll be the first to hear of any books in the pipeline! If you haven’t already, please sign up here – I’ll be eternally grateful to have your support! I promise to keep the emails short and not to spam you! They were! I highly recommend you get tickets if they come anywhere near you!